For the third time since the US announced the withdrawal of its troops from Syria, Israel has bombed a military location belonging to the Syrian regime and Iran, destroying a cargo plane transporting weapons from Iran and Iranian warehouses in southern Damascus and Syrian military bases. Among the targets, according to the Israeli media, was a senior delegation of officials from the Lebanese Hizbullah group that was visiting Damascus as they boarded an Iranian plane heading to Tehran. Israel claimed that the strikes had been made in defence of Israel’s security. Israeli Prime Minister Binyamin Netanyahu said his country was defending “red lines” in Syria. “We will not accept Iranian military reinforcements aimed against us in Syria,” Netanyahu said. “We will confront this aggressively and steadfastly,” also referencing the “disruption” caused by US President Donald Trump’s announcement that US troops would withdraw from Syria. 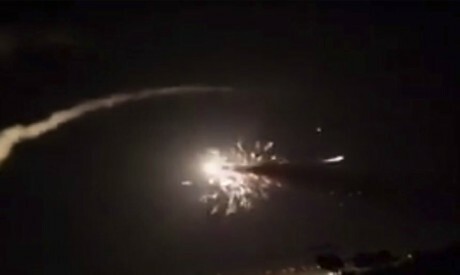 The Iranian plane that was hit, according to US reports, was part of the fleet of the Iranian Revolutionary Guard (IRG) airline Fars Air Qeshm, which had landed in Damascus for half a day. Israel claims the carrier is being used to transport military equipment to the Al-Assad regime and its ally Hizbullah. Analysts believe that through the strikes against military targets in Syria, Tel Aviv wanted to send a message that Trump’s decision would not prevent it from targeting Iran and its Shiite militias operating in Syria. The US withdrawal is unnerving for Israel because it could mean that Iran will have more freedom of movement in Syria. Since the start of the events in Syria in 2011, Israel has carried out hundreds of attacks against military targets in Syria belonging to the Syrian army, Hizbullah, the IRG, and even shooting down a Russian jet fighter. Recent strikes have been more widespread since the Russian plane was shot down over the Mediterranean in September 2018. Gadi Eizenkot, chief of the general staff of the Israel Defence Forces, said that Israel had been able to abort an Iranian plot to transport 100,000 IRG soldiers and Shiite militias into Syria, transforming Syria into a massive military base for Iran on the border with Israel. Eizenkot minimised the significance of the US decision to withdraw. “The US decision is dramatic and important, but we must not exaggerate. We have been dealing with that front by ourselves for many years,” he said. Commenting on military coordination between Israel and Russia, he said that the presence of Russian troops in Syria had created a new reality and restrictions on Israel’s activities there, but that security coordination between the two sides was playing a major role in the Israeli army’s fight “against terrorism”. The statements imply that Israel will always find an ally to support it in the region. Even if the US withdraws, Russia is a ready replacement to support Israel despite tense relations between the two countries since the Russian jet was shot down. Despite the US decision to withdraw and the belief on the part of the Syrian regime and Iran that they will have free rein to expand and deploy militarily as part of a plot to dominate the Middle East, Washington’s reassurances to Tel Aviv have allowed Israel’s Air Force to attack more military targets in Syria belonging to the regime and its ally Iran. It is believed that Israel put pressure on Washington to delay or slow its withdrawal to avoid a military void in Syria that Iran could fill, but that the US refused. Nonetheless, Israel has received a green light to attack anything that threatens its security from the US and Russia. Relations between Israel and Russia that were cool after the shooting down of the Russian jet are now gradually thawing, especially since Moscow did not take any measures against Israeli air raids or use the C300 missile-defence system it sent to Syria after the September incident. Russia verbally condemned the incident but went no further than diplomatic censure. Tensions did not escalate after the fighter jet was shot down, unlike when Turkey shot down a Russian jet and Moscow reacted strongly, including by severing ties and the threat of open warfare. Israel wants to reassure Russia and vice versa, and their relationship will not be impacted by verbal statements. The Russian missiles, two military bases and navy vessels in Syria have not been targeting Israel. The common interests between Tel Aviv and Moscow mean that their bond is stronger than ties between Russia and the Syrian regime. There are also doubts about the level of threat Iran poses to Israel. It has only used its animosity towards Israel as a slogan for media and political propaganda purposes, and it is unlikely Tehran will take any steps to seriously threaten Israel’s security. Iranian Foreign Minister Mohamed Jawad Zarif said last month that “when did we ever say we wanted to annihilate Israel? Find me one person who has said that. No one has ever said that.” Zarif added that neither founder of the Islamic Republic of Iran Ayatollah Khomeini nor former president Mahmoud Ahmadinejad had called for the erasing of the Jewish state from the map. It is likely that Israel will continue its current pace of air strikes against Syria, whether or not US troops withdraw, as long as the Syrian crisis continues to rage without a political solution in sight that is satisfactory to all parties. This does not seem likely any time soon.